Northern Australia has a landscape made for fire. Tropical rains support thick grasses in the rainy season; they quickly turn to tinder during the dry season. Fires can occur any time during the dry season, from its cool beginning between April and June to its hot, windy end between October and December. Though fires are larger and more frequent at the end of the dry season, several large fires burned on May 8, 2014, when the Moderate Resolution Imaging Spectroradiometer (MODIS) on NASA’s Aqua satellite acquired this image. The fires are outlined in red. 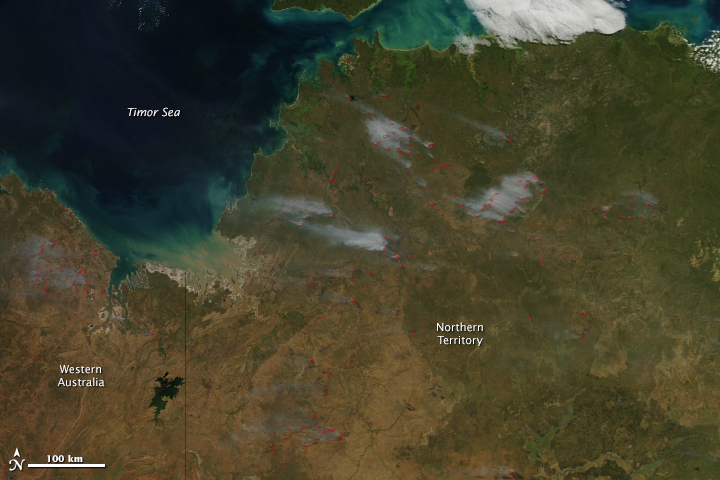 Fires in the northern part of Northern Territory produce dense clouds of smoke. This area includes savanna woodlands that burn every year or two. 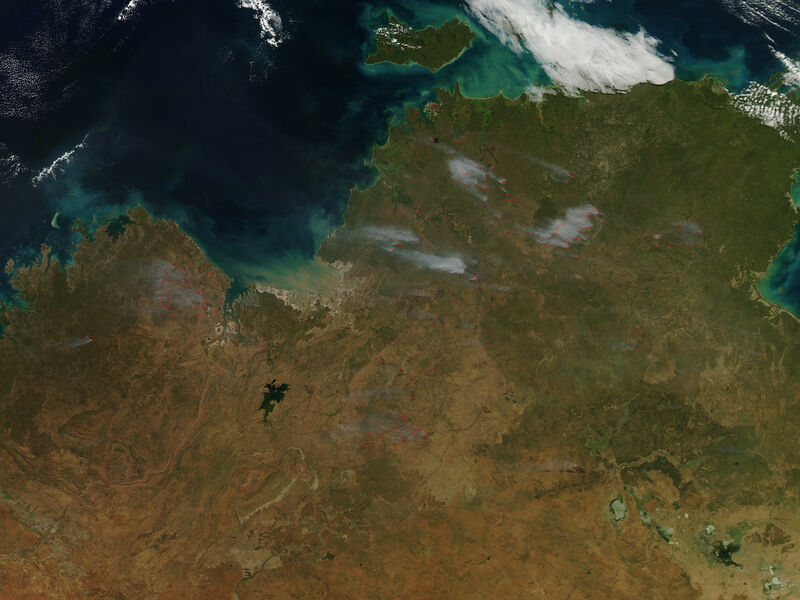 Fires in the southern part of the image, and in Western Australia, are producing less smoke and are probably burning in land cover where trees are sparser. Though large fires burn in northern Australia more than any other part of the country, the fires are not typically intense. Australian Government Geoscience Australia (2013, October 4) Australia’s dynamic land cover. Accessed May 8, 2014. North Australian Fire Information. Accessed May 8, 2014. Savanna Explorer Fire in Australia’s tropical savannas. Accessed May 8, 2014.